I have been really frustrated in waiting for days to log in to my VM Role instance via RDP. I have encountered this issue multiple times. 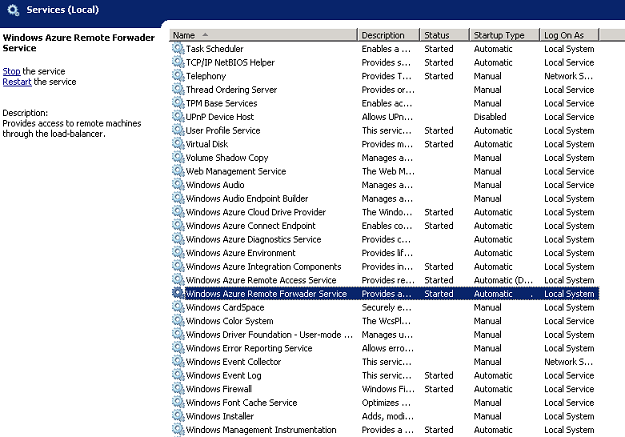 Once a VM Role is deployed or it is restarted, we can not login via RDP for a long period, and it takes a lot of time, sometimes 2-3 (random) days once it is back and allows us to connect via RDP. 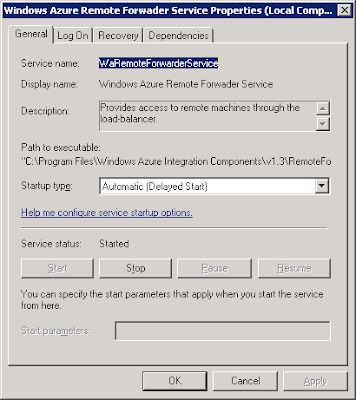 This issue occurs due to a problem with the Azure Remote Forwarder Service, which runs in your VM Role instance. Due to this service sometimes RDP packets get distorted which cresults in connection timing out or closing it. Since the release of Windows Azure SDK 1.3 we can now have startup tasks defined in the ServiceDefinition file for web/worker roles. However, this is not allowed for a Virtual Machine role. So what to do in case you need to have some tasks/scripts to be run on your VM Role’s startup? For example, your VM Role runs some software applications that require some configuration information that can be available only at run time. 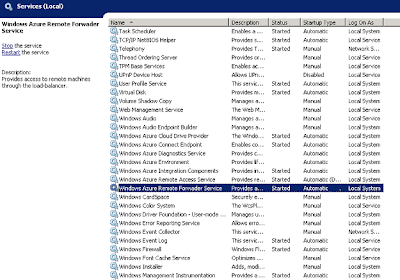 So, how will you have startup tasks in a Virtual Machine Role? If you think that it’s just an easy task that involves adding you tasks in the Windows Startup folder (C:\ProgramData\Microsoft\Windows\Start Menu\Programs\Startup), then you are mistaken. This is not going to work as the tasks in the startup folders are executed only when a user logs in to the machine, but this is not what you want. Your tasks should run whenever your role is started. 1. 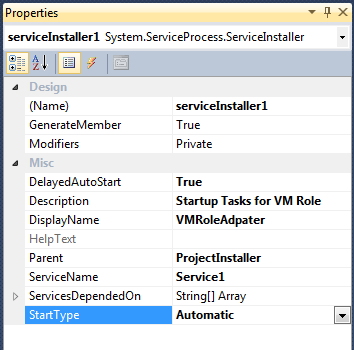 Create a WindowsService project in Visual Studio, let’s call it VMRoleStartup and write the operation you want to be executed at VM Role’s startup in the OnStart() method. 2. 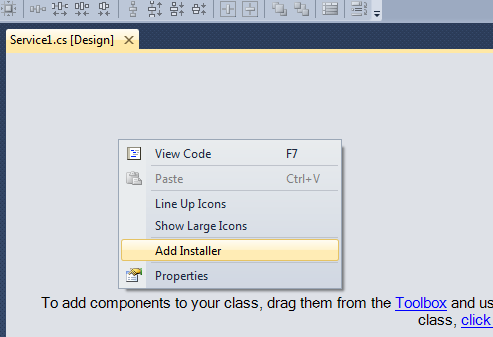 Add the installer class to the service by opening service’s class in designer mode and right-clicking. Select “Add Installer” from the menu as shown below. This class is used to install the service. 3. 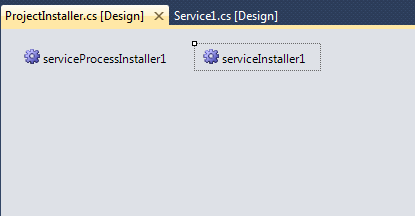 This will create a new class ProjectInstaller.cs with serviceInstaller and serviceProcessInstaller. 4. 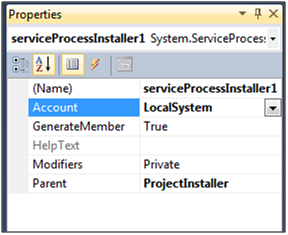 Go the properties of serviceProcessInstaller and select Account as LocalSystem. This is required so that the service will run as an administrator account. • Add Description and DisplayName as you want to be displayed in Services Management Console. • You can set DelayedAutoStart to True, to make sure that your VM role comes into a stable state before your tasks are started. • Set StartType to Automatic. 6. In the ProjectInstaller.cs class add the following code to start the service after it is installed. Please note that MountXService here refers to your service class name. 7. Build the application under Any CPU or x64 platform (because VM Role runs under x64 platform). 8. Copy the .exe file (along with dlls if required) to VM Role and install it using installutil by running it from command prompt as an administrator user. “installutil” is available in “C:\Windows\Microsoft.Net\Framework64\v4.0.30319” path. 9. Upload your image to Azure and create a service model for VM Role to connect to this image. 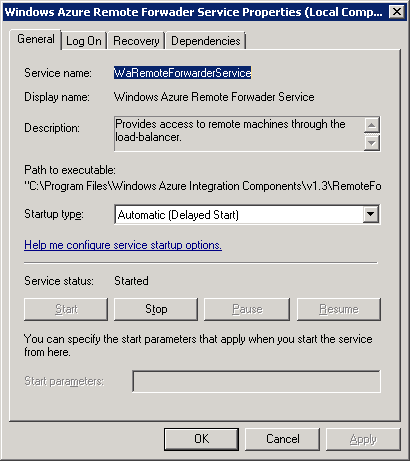 This is it, now you are done and when your VM Role starts your windows service will be started and will execute the code you put up in it's OnStart method. Today I was trying to upload my base image to Azure via csupload so that i can attach this vhd to one of my virtual machine (VM) role. However, I got a strange error with no details. I kept on looking for the reason and finally I found the solution. The reason for this error as i discovered was that the disk from where it was uploaded was full. When you use csupload it uses temporary directory for preparing image and by default it uses the location from where you are uploading your base image. So if this disk is full you get this error.